Next on your shopping list should be the case. It’s worth thinking about which graphics cards your folding rig will use when choosing the case. 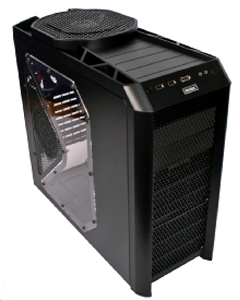 The reason for this is that although you can get away with choosing a cheap case for a gaming PC with a single graphics card, as your dedicated folding rig will house several graphics cards, you need to choose a case with excellent airflow. If your folding rig is going to house several mid-range single-slot graphics cards, such as GeForce 8800 GTs or 9600 GSOs, we’d recommend a case such as the Antec Three Hundred. This superlative little case is very cheap, typically retailing for around £50, and is very easy to work with inside. Its two exhaust fans, one 120mm in the rear and one 140mm in the roof are sufficient to keep two mid-range graphics cards and a CPU cool, but if you’re planning on populating all four PCI-E slots then you should fit a pair of 120mm intake fans to the front of the case. From left to right, the Antec Three Hundred, Nine Hundred Two and Twelve Hundred are some of the best cases for a dedicated folding rig thanks to their excellent cooling and low price. If your budget can stretch a little further, or you’re planning on using high-end dual-slot graphics cards, you should spend more on a chassis. High-end graphics cards emit a lot more waste heat than mid-range cards, so your case has to work much harder to keep them cool. 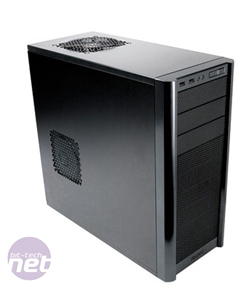 Our first choice would be the Antec Twelve Hundred, although the smaller and cheaper Antec Nine Hundred Two is also worthy of consideration. 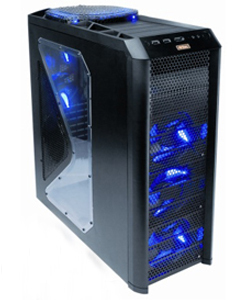 These cases are similarly designed to the Three Hundred, pulling in cool air at the front and pushing it out of the rear and roof, but the airflow is greater, thanks to their large number of fans. 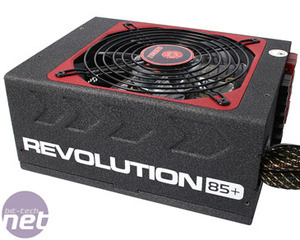 You also need to think about which PSU will be required to power your system. As there are so many variables, it’s impossible for us to recommend a specific PSU, but we can point you in the right direction. Firstly, you need to make sure the PSU has sufficient PCI-E power plugs of the right type (6- or 8-pin) for your graphics cards. We’d also recommend buying a modular PSU, as a folding rig only needs one hard disk, so you can reduce cable clutter by not installing lots of Molex and S-ATA cables that won’t be used. 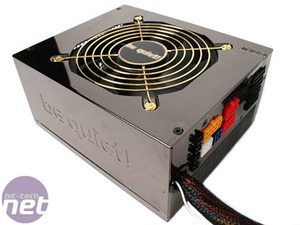 As most folding rigs run constantly, it’s also worth looking for a quiet PSU. In terms of wattage, there are several highly detailed free online calculators that estimate how much power your PC will consume, such as the eXtreme Power Supply Calculator. Once you know how much power your PC will require, check out the monthly Buyers Guides, which includes several excellent PSUs we’ve reviewed recently. The 650W Be Quiet! Dark Power Pro is easily capable of powering two mid-range cards or a single dual-GPU card. PCs with more than two graphics cards consume a lot of power and emit a huge amount of heat, so it’s critical to use a good-quality PSU, such as the 1.05kW Enermax Revolution. You’ll also need to invest in some RAM and a hard disk for your folding rig (and you may also need an optical drive to install Windows), but as none of these components has a direct effect on folding, you may as well buy the cheapest one you can find, or recycle components from an old PC. If you’re planning on running folding on multiple PCs (aka farming), there are several ways to reduce costs - see 'Building a folding farm' for info.